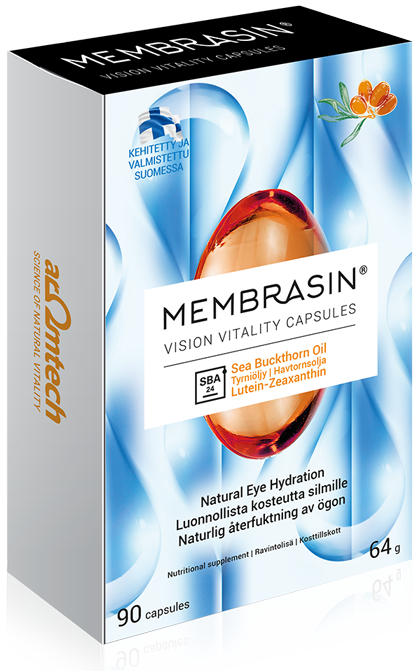 How quickly will the effects on eye dryness be noticeable? Typically results are experienced after 2-5 weeks of regular use. Should I take the capsules with meals? The capsule shell is fully vegetarian (plant based), made of maize starch. Yes, both the active ingredients and the capsule shell are fully of vegetable origin. The product is suitable for vegans and people with Halal and Kosher diets. Is the product gluten-, lactose and GMO free? Are the capsules suitable for children and what is the daily dosage? Children may take the capsules, because they contain a pure nutritional oil. The recommendation for children is 1-2 capsules per day. Does the product cause any adverse effects? No specific adverse effects have been reported. In people suffering from gastroesophageal reflux, all oil-containing products have the potential to cause symptoms, and for this reason it is recommended to take the capsules with meals along with plenty of water. A positive side effect may also be hydration of other mucosa as well as the skin. How is the oil manufactured, what method is used? SBA24® Sea Buckthorn Oil is manufactured by the SFE method (Supercritical Fluid Extraction), in which the oil component of the berry raw material is extracted by pressurized carbon dioxide. The gentle process does not include any harmful solvents and therefore results in a pure product. How has the efficacy of the product been studied/proven? The product has been tested in clinical trials in which efficacy has been compared to placebo oil. Efficacy has been tested by measuring, for example, the hydration level and elasticity of mucosa as well as with symptom diaries. Neither the examinees nor the researchers knew during the study which oil the examinees were taking. Can the the product be taken while pregnant or breastfeeding? Yes, the product contain quality controlled pure nutritional oil, free from contaminants or other potentially harmful substances. Can the product be used together with other fatty acid supplements, like fish oil? Yes, but then the recommended daily dosage is 1-2 capsules. Can the product be used together with medicines? If you are suffering from a serious disease (cancer, cardiovascular or cerebrovascular disorder, etc.) it is highly recommended to discuss usage of oil/antioxidant supplements with your physician.